Ronan Finn’s second-half equaliser last Friday was ruled out as the Hoops lost 3-1 to fellow European hopefuls Derry City. MANAGER STEPHEN BRADLEY felt his Shamrock Rovers side were dealt an injustice last Friday after Ronan Finn’s second half equaliser was ruled out during their 3-1 defeat to Derry City. Speaking after his side’s 2-0 victory against Galway United on Monday, Bradley said the loss was difficult to accept on the basis of captain Finn’s disallowed goal which would have leveled proceedings late on at Maginn Park. “It was difficult to get over the loss because I felt that we were robbed”, he said. “The goal that was disallowed for us was unbelievable. We were told the reason was because Gary Shaw had the goalkeeper’s jersey in his hand. But when you look at the pictures Gary is three yards away from the keeper and he runs into his own defender. Aaron McEneff had given Derry the lead after just five minutes before Graham Burke leveled proceedings 15 minutes later. Striker Barry McNamee restored his side’s lead before the break, with Finn’s tap-in appearing to level the sides with 15 minutes remaining. Referee Ben Connolly gave a free out, with Derry adding a third late on thanks to a second from midfielder McEneff, as Derry extended the gap between the sides competing for a European place to four points. “I can’t see anything… In fairness to Stephen Bradley at that stage it would have been 2-2. It’s a desperate decision. “We’ve looked at this time and time again and I can’t see anything wrong. If anything it was a foul on Shaw at the near post – there’s nobody near the goalkeeper. Rovers returned to winning ways last night as goals from Shaw and Brandon Miele ensured a third win in four as the Hoops brought Galway United’s nine game unbeaten streak to an end. “It was important that we came back here and lifted our heads because Galway are dangerous. Our lads were excellent tonight”, said Bradley after the win. “I thought we ran out very comfortable in the end. They had one or two chances in the first half but we realised at half time that we were making the game too big and that we were too stretched as a team. Midfielder Miele wrapped up the three points with a fine left-footed volley inside the box. It was the 22-year-old’s third goal in eight games this season. Having spent four years at Newcastle United before a return to Ireland in 2010, the Tallaght native has impressed since signing for the Hoops under Pat Fenlon at the end of 2014, scoring nine goals from midfield in the Premier Division last season. “We’ve had a look at Brandon in terms of getting him back to the level he was at two years ago,” said Bradley. Rovers face a tough trip away to league leaders Cork City at Turners Cross on Friday night. Second half goals from Achille Campion and Kevin O’Connor ensured a 14th win from 15 for the Rebels this season. 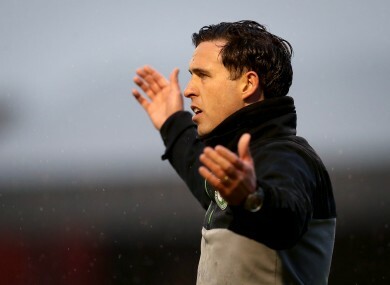 Email “'I felt that we were robbed' - Stephen Bradley admits frustration at disallowed goal”. Feedback on “'I felt that we were robbed' - Stephen Bradley admits frustration at disallowed goal”.